That is usually the point in the conversation when I start seething. Writing is hard. Writing is hard because it is important to society. It is how we communicate. It is how we tell others what we are thinking, what we are feeling, what we experience on a daily basis, and how we think society should change for the better. It is why we write texts and emails and novels and magazine articles and protest signs and notes to our friends sitting in the back of the class. It is a way of permanently putting your mark on the world, so if only for a second, someone can notice that you were here on the planet and you had some thoughts that needed to escape your brain. It’s hard because we use the ugly act of comparison to see if our path is similar to the others that came before us, the greats whose stories are still discussed every day in schools and libraries and book clubs, whose stories are read under the covers with a flashlight. We sit and we write and we pretend that duct tape is sticking us to the chair because, deep down, we hope that we can send a message to all of the other little girls with flashlights who are staying up too late, hiding their book under the covers, straining their eyes to find out what happens on the next page. We must think about these girls whenever we write. 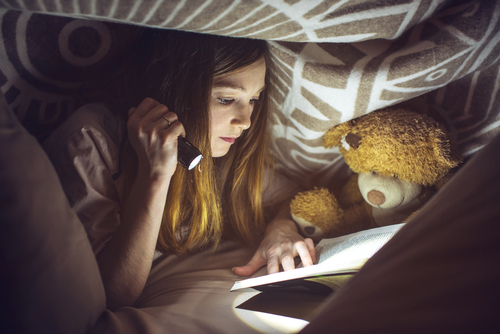 We must tell them to keep staying up late with these stories, to change the batteries when their flashlight dies, and to dive for the light switch when they hear their parents coming up the stairs. Those early mornings when they are grumpy and can hardly stay awake will be worth it when fresh tales of adventure, mystery, and friendship roll about in their heads. Tired, they may struggle to remember multiplication tables or state capitals, but they will be able to whisk themselves away, traveling to the cobblestoned streets of Paris or the field of Green Gables. We all agree, writing is hard. But we have characters we need to put out into the world, tropical paradises that haven’t yet been seen by anyone else, and talking animals in need of mouthpieces. Why must we continue to torture ourselves, scribbling in our notebooks and opening new documents on our computers? For those girls we used to be. Those girls whose eyes drooped, itching to stay open to finish the last chapter. Those girls who scampered about the forest, hopping from rock to rock, pretending to conquer their own kingdom. Those girls who got their own notebooks and knew that one day, their stories would be heard too. Do it for them. Don’t do it because of a degree or a job or because you were once told that you had a knack for it. Do it for them, and do it for yourself. Kate McCarthy is a Boston based writer. Her current ambitions include traveling the world and living a life that Oprah would approve of.